While holiday entertaining can be super fun, it can also be a source of stress, especially when you are looking to create delicious and memorable “food and wine pairings” for your guests to enjoy. CALIFORNIA LIVING® TV series creator and Party Girl Diet™ author Aprilanne Hurley comes to the rescue with the following fool-proof “Holiday Food & Wine Pairing Entertaining Guide” that will have you “surviving” AND enjoying every minute of the holidays – stress free with expert “food and wine pairing” tips, tricks and secrets from executive chefs, winery chefs and entertainment experts featured on CALIFORNIA LIVING® TV magazine show this season. Plus, if your plans are to be “home for the holidays,,” CALIFORNIA LIVING® has you covered from DIY Hollywood inspired holiday table-top design – to healthy, Party Girl Diet approved holiday recipes to feed a crowd this holiday season. Executive chefs, winery chefs and event pros interviewed on CALIFORNIA LIVING® agree, the best way to “survive” holiday entertaining and get the most enjoyment out of every minute of it – is to “plan ahead.” This means taking a look at your menu and deciding what dishes or elements of dishes you are serving can be made ahead of time. Planning ahead will ultimately give the host the ability to stagger the preparation and even cooking over a few days. Cooking a few of your dishes ahead of time ensures you will have plenty of time to relax and enjoy yourself and time with your guests the day of the party versus slaving away in the kitchen all day. Entertaining: When setting your holiday table-top, be sure to add a few open bottles of wine for your guests to be able to refill their wine glasses on their own without having to get up to do so. This holiday entertaining tip from Table-top design expert Marc Blackwell will ensure your guests feel welcome and will set the stage to enjoy a leisurely holiday meal. Wine & Food Paring: It has been said that the best food & wine parings are created by wines made from grapes and food sourced from the same region. Use this “same region” concept to create fool proof food & wine parings for your next party. Another pro food & wine pairing tip is to pair wine and food similar flavor intensities. For example, pair bold flavors like blue cheese with richer wines, and mild cheeses like goat and brie with milder whites. PS: If you find yourself searching for the perfect gift for the person who has everything this holiday season, CALIFORNIA LIVING® host Aprilanne Hurley’s all-time favorite holiday gift that “gives back” to the community: The Marine Mammal Center’s Adopt-A-Seal® Program– offering the perfect “feel good” gift for everyone on your list. 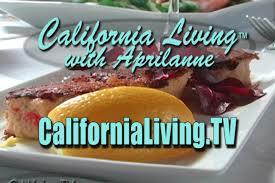 Aprilanne, Aprilanne Hurley, ca living, CA Living TV, California, California food and wine pairing, California holidays, California Living, California Living Magazine, California Living TV, food and wine pairing secrets, Food and wine paring, Home for the Holidays, how to pair food and wine, Inside Look TV Magazine, Napa Valley, Napa Valley food and wine, Party Girl Diet. Bookmark.